Michael Boatwright, 22, is facing a first-degree murder charge in the June 18 killing of the 20-year-old rapper, whose real name was Jahseh Dwayne Onfroy, Broward Sheriff's Office officials said. Authorities have arrested a second suspect in last month's fatal shooting of South Florida rapper XXXTentacion. 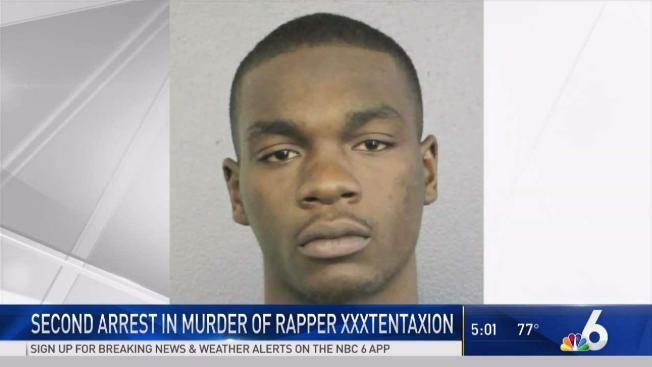 Michael Boatwright, 22, is facing a first-degree murder charge in the June 18 killing of the 20-year-old rapper, whose real name was Jahseh Dwayne Onfroy, Broward Sheriff's Office officials said Wednesday. Boatwright was arrested on July 5th on unrelated drug charges, and was charged in XXXTentacion's murder on Tuesday. He was being held without bond Wednesday and attorney information wasn't available. Authorities have already arrested 22-year-old Dedrick Devonshay Williams in the fatal shooting of the rapper, who was ambushed by two gunmen outside Riva Motorsports in Deerfield Beach. Authorities believe the motive was a robbery. Detectives are still seeking a second gunman as well as Robert Allen, a 22-year-old man described as a person of interest in the case. BSO officials released a photo of Williams that shows him outside the motorcycle shop the day of the shooting. Allen is also wanted in Broward County on a felony warrant for violation of probation for possession of PVP, AKA flakka, and carrying a concealed firearm, officials said.